How are Americans doing when it comes to the dental health of the 65+ population? 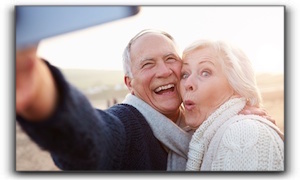 10% of adults 65 and over have moderate to severe periodontal disease. At Vanguard Dental Group in Derry, we are dedicated to providing our elderly patients with comprehensive oral health education and attentive care that addresses the special challenges that affect seniors. These challenges include difficulty brushing and flossing due to arthritis, dry mouth caused by prescription medications, tooth sensitivity, bone recession, and complications due to diabetes, heart disease and cancer. We want our elderly patients to not only have a healthy smile, but a beautiful one as well. Many of our senior patients have elected to improve their smiles with services such as crowns, inlays/onlays, dental bonding, porcelain veneers, dental implants, and tooth whitening. The majority of our smile transformation patients are thrilled with their new smile and report that it has improved their life immensely. They feel happier, more attractive, and more confident in social settings. The high tech team at Vanguard Dental Group provides the full spectrum of general and cosmetic dental procedures for Derry area patients of all ages, including dental implants.